4D Lash has 4 super-thin and ultra-light .05mm thickness single eyelashes placed very close to each other on the sticker strip in a "fan". Applying 1 Alluring volume 4D lashes gives the effect of 4, which of course also means better effect in time! 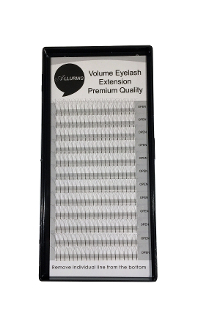 The Alluring Volume 4D Lashes can be easily used for customers who want 3D 4D 5D volume eyelash extensions. Now you can make it without any extra effort. No need to spend time on making “fans” – we have already done them for you!